Camps and retreat centers are all sacred, special places. We wanted to go a step further and know what made us unique as a camp and retreat center. So we hit the road to listen and asked "what makes St. Columba so special to you?" Many of you provided extremely valuable input and I'm so grateful for the response to surveys, interviews and inquiries we made over the last six years. Priests, volunteers, guests, campers, camper parents, group coordinators, donors and other key stakeholders all had their voice heard. As a ministry of the Episcopal Church in West Tennessee, we also asked Episcopalians what they wanted out of St. Columba. What we found was not only that we are quite special but finally described what the "it" is at St. Columba...the things that made us unique. These key ingredients are the things about St. Columba that are valued by the people we serve, and therefore are the untouchable, sacred purposes for our ministry. St. Columba’s inner-city overnight camp and Camp Able for children with special needs both use Scheibler Lodge so we largely close the center’s retreat ministry during June and July. With two overnight lodges, St. Columba can only host two overnight groups per weekend ranging from 10-50 people. In 2015 and 2016, we turned down a combined 58 groups that we could have hosted if we had more lodges/beds. Most groups require weekends between Feb-April and Sept-Nov. We estimate 1000-1500 people per year aren't able to gather at St. Columba because we're already booked. St. Columba operates on a yearly basis with only roughly 60% of its revenues coming from camp and retreat fees. The remaining 40% is made up of a mixture of Diocesan support, trust income and fundraisers. By serving more people, St. Columba will bring in more income to support its camps, maintenance and operational expenses. The following planning model was created to instruct the work of the master plan committee and Board. Any long-term ideas that made it to the final master plan had to balance responsibility for preserving what's special about St. Columba, supporting our youth and community ministries, and generating needed funds to remain sustainable. Serve more Episcopal, church, youth groups, schools, and community nonprofits. Expand camp lodging areas to launch overnight camps, re-imagine Camp Able as an overnight camp and aim to always have available space for retreat groups. Add universally accessible camp and retreat lodging to serve campers and guests with physical disabilities. Remove limitations that prevent Mid-South guests from finding available space at St. Columba. 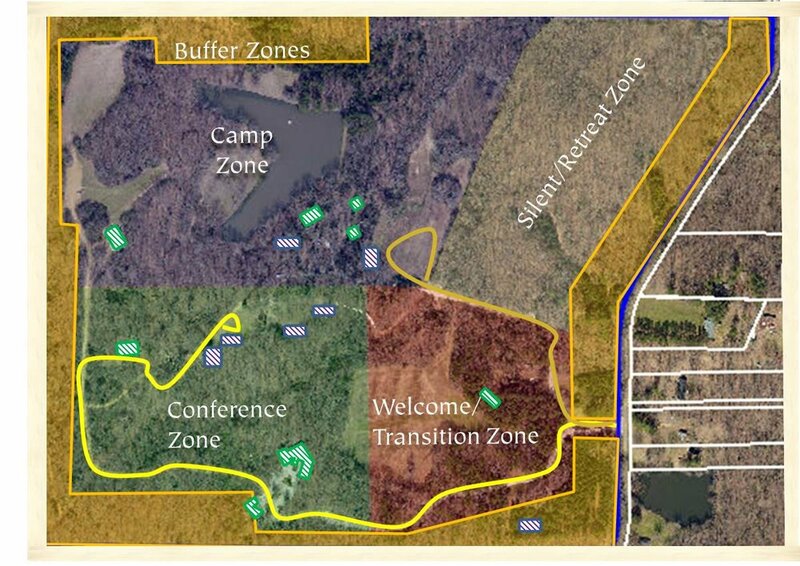 Preserve areas of the property to honor the different ways campers and retreat groups use our campus. Become a sustainable ministry by stewarding St. Columba's environmental and financial resources. Enhance rates-based ministries and reinvest in preservation, program improvement and sustainable ministries. Ensure the proper use of St. Columba's campus by minimizing environmental impact of expanded ministry to youth and adults.